Every person is unique in each class. We've all experienced a different journey in life and need to be able to respect our own inner wisdom as to which yoga poses are appropriate. So, in my classes we'll practice at our individual level with humor and lightheartedness, looking to remove those judgements and preconceived notions of what we think we should be. "I have been taking hatha yoga classes for more than 25 years in various locations and Susan Kain is one of the best teachers I have ever had. She describes each pose clearly -- managing to challenge both beginners and more advanced students. She is quite knowledgeable about the origins of yoga and shares her knowledge with the class. Moreover, she makes each individual student feel comfortable and cared for. After each class, students can carry the good feelings home with them -- by picking up a herbal teabag or a strip of paper with a wise saying on it. I would highly recommend Susan Kain as a yoga teacher." In this 45 minute practice using the support of a chair, all can enjoy the peace and self-awareness that yoga brings. 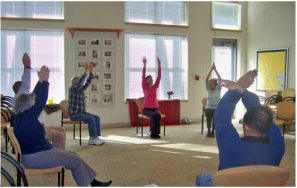 No matter what your condition, we'll gently loosen the entire body through seated stretches. Choose to stand for a brief segment of balance poses, using the chair for support, or remain seated throughout the entire class. A brief relaxation and meditation segment conclude each class. Experience the relief of pain, increased flexibility, and calming of anxiety in this gentle, beginner level class. Energize your body, mind and spirit through classical poses building strength, stamina, flexibility and balance. This class will also include basic yoga philosophy, breathing and relaxation techniques. No matter what shape you're in or whether you've taken a class before or not, all can enjoy the peace and balance a yoga practice offers. With a gentle, non-intimidating approach, yoga poses are broken down and modifications are provided for those with injuries or illnesses.